4K UHD display, longer battery life, faster processor, all of these makes iPad Air 3 a perfect device for movie watching. When it comes to movies, how can we say no to free movie downloads for iPad Air 3? There are several different ways to download free movies to iPad Air 3 without iTunes or Amazon Instant Video, resort to a free movie downloader for iPad Air 3, free HD full movie download sites for iPad Air 3, and free movie download app for iPad Air 3. Without ads nor malware, the robust movie downloader, MacX Video Converter Pro gives chances to download free Bollywood Hollywood Disney MP4 AVI M4V full movies for iPad Air 3/new iPad Pro/Air 2/Mini/Pro speedily from 300+ movie sites, covering YouTube, Dailymotion, Vimeo, Letv, Tudou, and more. Normally, a movie trailer downloading task can be finished in a matter of seconds. Massive movie resources the iPad Air 3 movie downloader provide is incredible. 720p HD 4K UHD and even 8K free movie downloads for new iPad Pro 9.7in can be handled without any hassle. To download free movies for iPad Air 3, just find the movie resource, copy and paste the movie URL, the movie downloading program for iPad Air 3 can deal with extra work for you. Step 1: Free download the movie downloader for iPad Air on Mac or download Windows version, and run it. Find the movie you wanna download to iPad Air on YouTube, or other legal & safe movie sites, open it. Step 2: Click "YouTube" icon on the main interface of the movie downloading software for new iPad Pro/iPad Air, copy and paste the movie URL to the box frame and click "analyze" button to load the movie info. Choose movie res(720p, 1080p, 2160p, 4096p etc. ), format(MP4, AVI, MOV, MKV, FLV...), codec to download on iPad Air 3. Step 3: Hit "Download Now" button to start HD full movie downloads for iPad Air 3. You can choose "Auto add to convert list" if the movie for iPad Air 3 is formatted MKV, FLV, etc. iPad rejects to play, and the movie downloader for iPad Air 3 will direct you to the conversion page. This is a problem: it is at high possibility that free movie downloads for iPad Air 3/2/Pro/Mini from movie sites is formatted in MKV, FLV, MTS, M2TS, AVCHD etc. that are out of iPad Air 3 supported video formats. Is there any way to play free downloaded movies in MKV, FLV, MTS etc. on iPad Air 3? 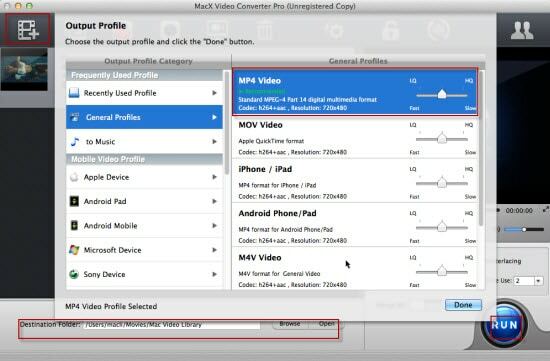 A video converter for iPad can deal with it. The free movie downloader for iPad Air 3 mentioned above, MacX Video Converter Pro also works as a solid iPad Air 3 movie converter. The free movie downloads program for iPad Air 3 can convert movie of SD HD 4K 8K MTS M2TS AVCHD FLV MKV etc. to MP4, MOV, AVI, M4V movie formats accepted by iPad Air 3 without losing image quality in 5× faster speed than before thanks to Quick Sync Video tech. To convert free downloaded films to iPad Air 3 format, load movie file, choose format, and click "RUN" button to start conversion process. It's easy to find free movie app for iPad to stream movies on iPad Air 3, in such iPad Air 3 movie apps as Netflix, Popcorn Time, Hulu Plus, Crackle, MovieBox. But none of them includes free movie downloading access for iOS 9 iPad Air 3. Below we sort out top two free movie download apps for iPad Air 3/2, 9.7-inch new iPad Pro/iPad Pro/Mini, bigU Movies App and UnlimDownloads. BigU Movies App - the free movie download app for iPad Air 3/new iPad Pro can both stream and download free movies on iPad Air 3, including best movies of 2016, HD free movie downloads in full length on iPad Air 3. The iPad Air 3 movie download app can be downloaded for jailbreak iOS devices. you can open, http://imoviesapp.com/, and download the free movie download app for iPad Air 3(5.2MB). The app is quite clean, not brimming with advertisement. But before download films on iPad Air 3, users have to register first. UnlimDownloads - the iPad Air 3 free movie downloader app offers MP4 M4V full movie downloads on iPad Air 3, yes, format is limited. The app can be downloaded via iTunes, so you must have installed iTunes and have a free account, or you can google UnlimDownloads and find a trustworthy site to download the application. Pay attention that it pops up ads when downloading free movies on iPad Air, and it crashes occasionally. The free movie download app for iPad Air 3 also gives Apple users free music downloads for iPad. Free download the iPad Air 3 movie downloader & converter to download and convert downloaded movies formatted MTS M2TS AVCHD FLV etc. for smooth movie playback on iPad Air 3/new iPad Pro with original quality. Many movie sites provide free full movie downloads for iPad Air 3， although some movies formatted MKV FLV MTS etc. unaccepted by iPad Air, but a video converter recommended before solves the problem. These free movie download sites for free film downloads for iPad Air 3 can be divided into several different groups: Hindi movies download sites, anime download websites, Bollywood movie sites, torrent movie download sites, 3D movies download sites, etc. The internet makes it deadly easy to download Hindi Bollywood Hollywood Disney, 3D Blu ray, HD full movies for iPad Air 3. We choose two best of the best here for movie downloads to iPad Air 3 for free. MY DOWNLOAD TUBE - This free movie download sites for 2016 new iPad Pro/iPad Air 3 features very rich movie resources from Hollywood, Bollywood, Disney. New movies are added frequently. Hot movies, featured movies, most popular movies, newly added movies, you can always find the movie you want to download for iPad Air 3. The site is nifty, has no endless popping ups. The free HD movie downloads site for iPad Air 3 is generally good, the only thing you need to notice is that there are many redirects. bharatmovies - this free movie sites is especially shared for free Bollywood movies downloads for iPad Air 3/new iPad Pro. Still movie resource is updated everyday. You can are provided Telugu, Tamil, Malayalam, Kannada, Bengali, Marathi full HD DVD movies downloads to iPad Air 3. Spice video clips are also included for free downloading. Be cautious to the hidden tricks, like redirects, spam, ads.